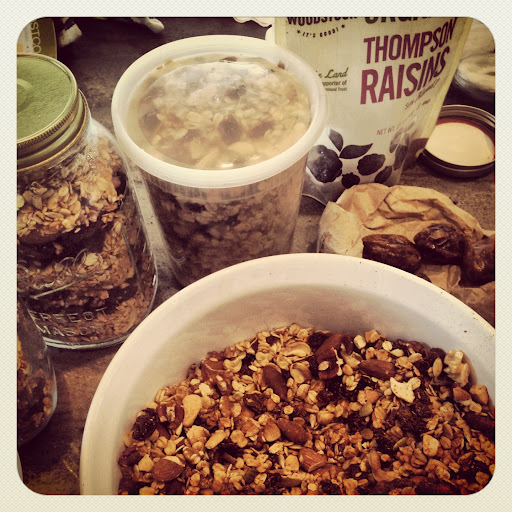 I was amazed when a friend said she made her own granola from scratch– it seemed like a magical and mystical accomplishment. I tried it myself and it is SO easy, much less expensive and super satisfying. I am very picky about extraneous sugar in my life, so I doctored the following recipe to make it high in seeds, nuts and yum, low in sugar/fat. After a couple tries I decided to “go big or go home” when it comes to granola so I can gift some when I make it. I encourage you to use this recipe as a reference, but experiment with your favorite tastes. All ingredients are local and organic when possible. Preheat the oven to 375 degrees Farenheit. Spread the nuts on 1-2 baking sheet and roast for 10-12 minutes, just lightly browning them. Transfer to a board to cool and chop. Set aside. Reduce oven temperature to 300 degrees F. Pour the oats and seeds into a mound in the center of each baking sheet (2). Melt the butter in a small pan and mix in maple syrup mixing constantly. Add the salt. Drizzle this into the center of the oat/seed mounds. Stir well and spread in an even layer on each baking sheet. Bake the oat mixture for 30 minutes. Let cool. Combine the oats, dates, raisins/dried fruit, reserved nuts and spices in a huge bowl and mix. Eat, enjoy, repeat! I am addicted to water. 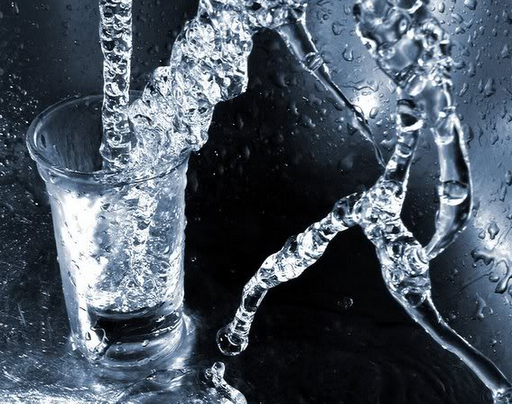 I have been drinking at least eight glasses of water a day for the past month. It has become a second job, an obsession of sorts. It takes a lot of determination, thought and energy to actually accomplish this task every single day, but I am committed. I had always heard that drinking water was a good idea, but it seemed like an intuitive notion that would be good to do tomorrow. Then I got a spot of benign skin cancer removed. It was a scary diagnosis (though I admit hardly anything in comparison to what many people go through). I asked my my dermatologist what he recommended besides the whole sun block schpeel. I was hoping for a classified medicinal, scientific secret. He simply responded,”Drink a lot of water. I drink a lot of water.” I was a little dumbfounded, yoga, fasting, meditation and sixteen years of organic vegetarianism hadn’t protected me from cancer. 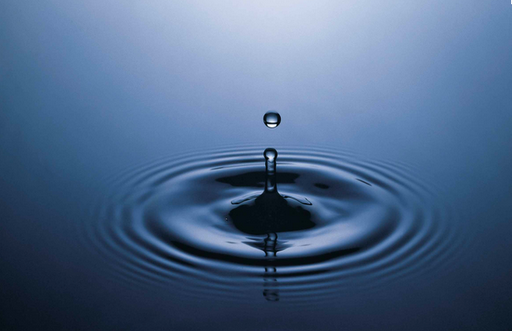 Drinking water seems so much simpler, obvious, maybe even trite. I didn’t realize until I the diagnosis, that the pursuit of many of my actions has been out of fear of disease and in an attempt to protect my body from the unknown. I felt like I had tried “everything else”, so I committed to drinking eight to nine glasses a day. In the beginning, I had an App on my iPhone that helped me keep track. Now I “do water” before I do anything else- two glasses in the morning, a glass before a cup of tea, a glass before a meal, a glass before coffee. If I am hungry = water time. If I am tired = water. I don’t need coffee, the way I used to need it. And rather than taking time every few months to detox with herbs and special yoga poses, I don’t feel clogged up or congested in a way to need that, I just keep drinking water. I think I might be addicted. But I also think I am ok with that because it is easy, feels really good (and yes, my skin is more clear and have more energy) and I am so grateful I live in a place where I can drink out of the tap. I have been urging many of my friends to blog about their journeys because their plans sounded so interesting (i.e. driving from Southern California to Alaska, or traveling to Asia to study massage); and consulting other yoga teachers about the benefits of blogging consistently. I realized yesterday, I have not been taking my advice while traveling for the past six months. It looks like I will be traveling for at least twelve more assisting at yoga conferences and events, visiting friends and family and exploring the country trying to figure where I will settle down; so I am committing to writing once a week this year and hope you enjoy the journey as much as I do! Last week I landed at LAX, I was looking forward to getting out of the airport and directly onto Amtrak—the train station I had seen so many times on my voyages up and down the Southern California coast. I got my hiking backpack (the perfect size for wilderness or urban trekking) and walked outside, right in front of me was a free shuttle, I asked if it was going to the train and the driver said, yes, this is going to the train.” In this simple exchange we both presumed that there would be only one train. I was thinking Union Station in downtown Los Angeles, the reality revealed itself to be much different. One and a half hours on the public transportation system through South Central LA, four metro changes, a few brushes with crazy and a $1.50 later—I finally found myself at Union Station where I could grab an Amtrak train to head north (on which I would pass the easily Amtrak accessible Bob Hope Burbank Airport). This week, to get back to LAX, I took the recommendation of a friend and tried the super cushy FLYAWAY bus. The morale of this story is to ask for local advice if you really want to get somewhere the savvy way. 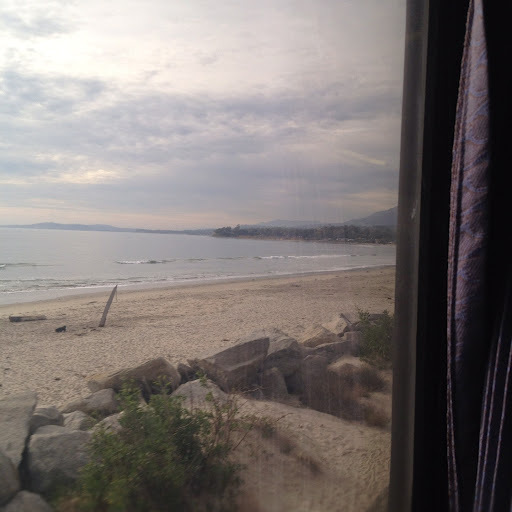 In my not-so-local (because I wouldn’t consider myself local anywhere right now) opinion, I highly recommend taking Amtrak anywhere you can in Southern California. As long as you don’t mind a 30 minute delay which is not uncommon, the ride is filled with spectacular Pacific Coast views. An upgrade to business class gets you a snack pack, wifi, a split of red wine and so much leg room I had trouble reaching the foot rest! It is one of my favorite ways to travel- relaxing, beautiful and comfortable. Today started off as the adult version of the terrible, horrible, no good very bad day in every possible way. I roll out of bed after not enough sleep, and into the car to spend forty-five minutes driving around my neighborhood looking for alternate side parking– getting stuck behind garbage trucks and eight wheelers dropping off their deliveries, after taking every wrong turn possible to no avail. I make a deal with the universe in my head (although, I have no idea what might have been in this for the universe) if I don’t find a spot in five minutes I’ll drive to work today (ugh). Ok, how about seven minutes? The universe is not making deals with me today, as I turn onto a street that has half an hour left, ok, the universe is making compromises. Half an hour to shower, change, grab something (which ends of being coffee) and get ready for the day. I return thirty-two minutes later, after running down the street spilling coffee everywhere, to a sanitation vehicle man writing a ticket. I guess I won’t have to drive, as I am paying for the spot which yields the cranky-crowded-rude- pushy-occasional-absolutely-crazy-person-commute-we-are-delayed-because-of-train-traffic-now-i-am-late section of the day. So I begin wondering why do I live here? A little week ago I was stretching on the beach in North Carolina, contemplating how forgiving and supportive the sand was of my splits pose and the tight outer leg of my pigeon pose, meditating on the ocean horizion and basking in the wonder of the sun. The month before that I was hiking, cooking with friends and living in the woods… This transition back to my reality is not going very well, I am feeling. And I can’t stop asking why AM I living in New York City? I ponder the question throughout the day as my body gets more tense and unpleasant email conversations arise at work; and though the sun is indeed shining on the New York City, I am inside in a terribly chilly office, as I get more cranky, crazy-feeling, caffeine-driven and intense feeling. A couple meetings and crunchy back later I am on my way home. I decide that I could be committed to thinking about and wallowing in the horrible, terrible, no-good, very bad day– or not… and a subtle, yet perceptible shift begins to occur, I notice some things that make me smile: the woman with a huge bird ring on her finger; the guy reading The Alchemist on the train; all the different shades of skin color on the subway; the funny-crazy person; the clouds above the apartment building across the street; the farmers market peach i shared with my friend; teaching yoga; my friends’ new dog; a piece of pizza after eleven pm; that the studio doesn’t move (like sand does) under my handstand practice. None of these things from the beginning of the day until the end mean anything, but by the meaning, the perspective I choose to give. It is powerful, and so very difficult. I am committing to keeping up with this blog, at least once a week, because time moves so quickly here, there is hardly a chance to absorb the experiences– let alone reflect, and I don’t want it to slip through my hands un-remembered. Good or otherwise. This is the hardest time of year for me, even in “sunny Southern California” the days are shorter and a little colder. I find myself a little more anxious, worried, annoyed with day to day life. For some reason around now, everything mundane thing feels a little more difficult. I spend a week or two drowning in the frustration at myself about feeling frustrated– and then inevitably one day I remember this is a annual “thing”. I fantasize I could write myself a letter to send promptly that will arrive 365 days from now, to remind myself mid-January next year that I always feel somewhere between the blues and mean reds. And that the cure is simple: more meditation, more yoga, more sleep, less computer time and that I can be nicer to myself. Maitri in Sanskrit or Metta in Pali translates as many things: loving-kindness, compassion, friendliness, benevolence, good will, friendship, the list goes on. Many of the translations make me think of doing things for others, and when I am in my current state of being I don’t like to think about doing nice things for others, or even thinking nice things for others (well, unless someone does something nice for me, then it is easy). My meditation teachers have revealed that Metta does not dictate that we first or only give this to others, but first we meditate/contemplate/ruminate on Metta towards your own self, your own being, your very life in this moment, right here right now. And from there the spiral of positivity can lead to outward as it will. Patanjali (the guy who wrote down the Yoga Sutras) even suggests that in place of asana, pranayama or meditation the practice of Maitri can be a powerful one on the road to a peaceful mind. If visualization or meditation on the direct idea of Metta/Maitri doesn’t work for me in the beginning I like to recite this chant. It helps kick-start things if you will: lokah samasta sukinoh bhavantu— “May all beings have happiness and causes of happiness” (Wah! has a beautiful recording, if you need a little outside help kick-starting the process). And when I am really feeling cranky, irritable and wronged, I simplify it even more into this mantra– I want for you what I want for myself. Then I go back to my meditation seat, focus on my breath for a while and focus on sending some loving-kindness to myself. So my question of the month is: how can you be a little nicer to yourself right here, right now? (If multiple answers pop up in your imagination, then you should give yourself permission to try them all with delight). As the northern hemisphere slows down, shouldn’t we too? 1. my yoga first. First thing in the morning, before food and everything else. Just for the next week. I am going to invite the fire of tapas in to help me slow down. I will let you know how it goes. A few months ago, I finally listened to the call of my intuition and realized it was time for me not to live in New York City anymore. I didn’t know where I was going, what I was going to do exactly, but I knew I needed to leave. My time was up in the big apple, I was spinning my wheels professionally, and emotionally. My being and existence was burnt out in every sense of the word. I had been trying to “make” it in the city that never sleeps, by simultaneously living at least three different lives over the course of five years that I can distinctly recognize as I look retrospectively. (A visit to an acupuncturist confirmed my kidneys, liver, and chi were all depleted, well huh that explains some things). I had become really good at setting goals, making plans and accomplishing tasks. Man, oh, man are my to do lists great (although I still wonder why it doesn’t feel as good to complete them as it feels bad not too, but that is another story for another day…). I thought, as I resigned from my stable-yet-slightly-prestigous job and moved out of my super-hip apartment, that I was completely uprooting and going as nomadic as possible, committing to only short term plans and goals. Maybe California to NYC to Australia became plan A, otherwise titled “The Plan to Not Make A Plan”. First stop, Santa Barbara California for a few weeks. Little did I know what this idyllic city had in mind for me, little did I expect to be welcomed with open arms and held in a very, very comfortable embrace. I had arrived in late June, hired to co-direct a youth circus. This in and of itself was a joyful experience. The ambiance of focus, hard-work and passion was unparalleled. I had never had the opportunity to go so deep in work with students so young, and feel so supported, while also being able to fully focus on one project and taken to my edge as a teacher and director. It was a relief and an inspiration. And after work, all the things I love were at my door-step: farmers markets, the beach, the park, hiking, biking, kayaking. There was little not to love. Then the unexpected and unthinkable happened, the theater company invited me to join the their ranks as an actor. For the first time in my life someone was offering me a position to do what I loved, had trained, worked, sweated and practically bled for. Something I didn’t realize until that moment I had pretty much given up on in the past few years. Surprising myself, I was reluctant to say yes. I sat for a couple of weeks in this place of hesitation, in wonderment at my recalcitrance. Then it dawned on me: I had become very attached to my plan to not make a plan. I really liked the idea of the freedom that the unfettered and unrooted life seemed to promise; but this present opportunity was something I had yearned for for years. I finally said yes, but not with the open-hearted joyfulness I expected of myself, which I see is simply because that commitment is saying no to a certain realm of infinite possibility. I let it go slowly but surely, plan A has become a hope for another day. And I have begun practicing letting go of the plans I make on a day to day and week to week basis. Some plans are necessary (when work or plane tickets are involved); but what to do for dinner is not, to go to the park or to the beach. It feels really good, and at times like I am stepping into a brand new unexpected relationship with myself.